I don’t quite recall the exact circumstances when I first noticed him. He never did anything in the kennel that would draw your attention to him. Just went about his business in the quiet and gentlemanly fashion that characterizes most of the heroes of his breed and of his sport. He was a medium-sized, dark brindle fellow, who was very correctly conformed. He had a bit of refinement about his head, which was almost effeminate, but not quite. Maybe it was his eyes. He was nearly perfectly balanced—- neither too long, nor too tall, and not too fine, not too coarse. He was supple and lithe, not blocky and muscular. He was reserved of nature, and never boisterous. He walked with a slightly stiff, side to side shuffle, and that, rather than the considerable graying of his muzzle, spoke eloquently to the ardor with which he had long been in relentless pursuit of the lures at Multnomah and Revere. I had heard that he was kept in the home of his owner in Portland, where the locals had the option of doing such things, and could still race their dogs of their own accord, from their own homes. The legend had it that he used to ride around with his owner in a racey convertible, and was plied with the various entrapments of decadent modernity, like hot dogs and ice cream, and that he was otherwise treated like anything but a professional race dog. He was sent to us each season as the racing wound down in Oregon, and not always none-the-worse-for-wear. He ran hard every time he raced. He had a balky right shoulder. He had a balky right hip. He liked to be as close to the rail as a greyhound could position himself, and he was a skillful enough and experienced enough a campaigner, to nearly always avoid the serious troubles that the sharp and trying first turn at Revere could often present. He could leave the box as quickly as most other greyhounds, but against the iron of the current lot of sprinters, he would have some trouble keeping up with them as they rushed to the turn. He was perfectly suited, by nature and breeding, to be a 6 turn, 660 yard specialist, where the quick breakers, who are railers and who are courageous when running the turns, can break from the box and race right into one. But the 3/8ths course was particularly testing at Revere, and slightly longer than the standard 660 yards. I thought it was too much to ask of him at this point in his career. With a little concentration on his particular areas of bother and concern, it was apparent, this year, as in those previous, despite his advanced age, that he would again be competing against the best greyhounds at the Wonderland oval, who in those days, were some of the fastest in the country. The lament, among his intimates, and yours truly, was that he had never had a chance at a major stakes championship in his younger days, because there was always some nagging little injury that kept him from competing at the various times when opportunity presented itself. Master Chee was as hard-trying a greyhound I ever knew. As reserved and polite a kennel-dweller and companion as he was, he was twice the huntsman, when the chase was on. The mere sight of the racetrack transformed him. This was the last year that we were to share one another’s company. I knew it, and I think maybe Chee knew it, too. And as we began what I figured was to be the final chapter of his career as a racer, he had his usual bad luck of the draw, failing to post inside the 5 hole for what seemed like an eternity of racing. 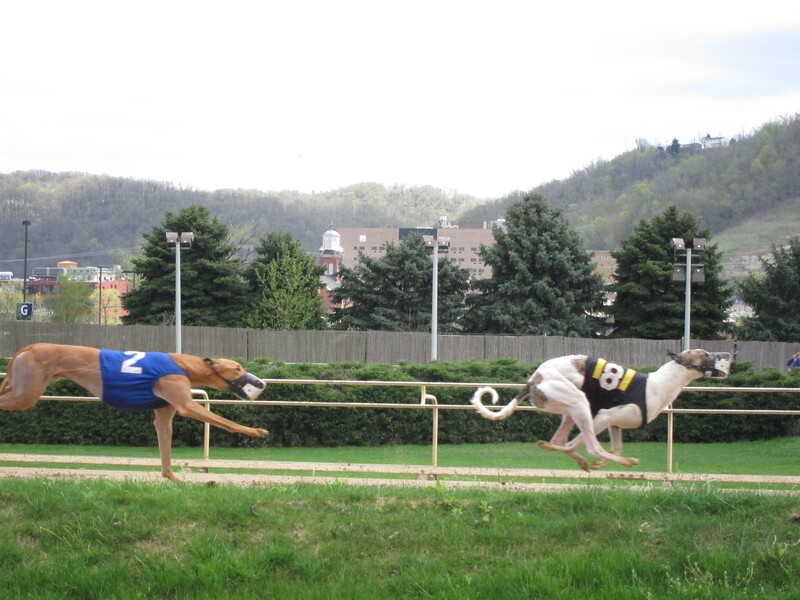 As usual, he delivered a string of stirring, skillful, hard-knocking, hard luck and hard-earned placings and showings against the best greyhounds the Northeast had to offer, and who were mostly 2 and 3 years his junior. Chee was a pleasure to be around. After a race, it seemed to me, he was always appreciative of my ministrations to him, considering his age and somewhat delicate condition…. and each time he ran, it seemed that it was his way of saying thanks. Sometimes you just know what they are feeling for you, and I always knew that Chee and I connected on this level. He loved to run, and I loved to help him and then to watch him run. He certainly wasn’t the fastest greyhound I ever handled, or even in the kennel at the time. But he was the most clever, and maybe the bravest. As the autumn wore on and turned into the brittle winter, I became a bit concerned about Master Chee. He just couldn’t buy a break and draw an inside box, from where he was particularly effective. He had raced admirably from the outside, from where it seemed the cruel fates had ‘seeded’ him forever. But he needed an inside post at this stage of the game, to be able to display his true talents, which though in decline, were still apparent, to anyone who had been paying attention. Around this time, a greyhound named Rediscovery was burning up the track, and humbling even the fastest greyhounds on the grounds, overpowering them with an irresistible turn of foot on the backstretch, and from the mid-track line he preferred, which was the golden trip, on the rail-heavy Revere oval. He had won 13 races in a row, breaking in at Las Vegas, and since shipping to New England, had taken 10 races out of 11. He was a flashy white greyhound, dappled with red brindle patches, and when you watched his races on the in-house monitors, running in full pursuit, he appeared to be a blur. He was that fast. Many were suggesting that he would be more than a match for the great OK Troy and Hondo Monopoly, who were also to be in the mix at Wonderland. Master Chee, finally, one day, drew a 3 hole in the feature race. However, poor old Chee was to face the very same Rediscovery, who was breaking from the inside box, where he didn’t actually want to be. Not that it made much difference. Rediscovery hadn’t yet been hooked by anyone in his career. I just mentioned that he was just some old dog from Portland, and let it go at that. Truth was, Chee looked tremendous for his age, grey face and all. He was shining like an apple, and seemed to have eased out of his aches and pains during the last 2 months. He was all class and heart, even though he didn’t necessarily suggest it as he ambled stiffly along, never seeming to notice the other greyhounds. He knew why he was there, though. I don’t remember much of what happened after that, on the night in question. But the feature race was to prove more than memorable to me, if to no one else. As they announced Master Chee as the number 3 greyhound, he went to the patrol judge with the same abundant grace and quiet dignity that he exuded in the kennel, and I looked at him admiringly, and with a sense of awe, at how long and how well he had performed all his career…. and thought to myself how fortunate I was to have known him. I was so proud of him. When the box sprang open, Master Chee had jumped first. He was looking to move to the rail, but Rediscovery had control of it, and was out-rushing Chee to the turn. I could see it then, in my imagination…..
……the white dog cuts Chee off, as he moves to the center of the track to take his preferred line on the turn, and Chee offstrides and falls behind…….it had been that sort of year for Chee…..but as they passed the wire for the first time, Rediscovery was already clear of Chee and displaying unbelievable brilliance in his move to the bend. Chee took the rail as Rediscovery moved out to his lane at the point of the turn, and he ran the turn tight and fast, and actually picked up a length on the leader. Chee had pulled about even with the blur as they straightened out into the backstretch, but Rediscovery gruesomely poured the pressure on, and drew clear again by a length, before they even came to the toteboard. Chee was moving well on the deep part of the track, but he was no match for the sensational white dog, as they passed the tote, and swung into the far turn. Still, he strode on, grimly, and they had separated themselves from the field. Rediscovery was on the mid-track, and Chee was flanking him on the rail, saving precious ground, but laboring against the depth of it. As they entered the stretch, it was hard to tell who was actually in front, or by how much, from our head-on vantage point by the escape turn, at the end of the homestretch—–but it was apparent, by the deafening roar of the crowd, that Rediscovery had finally been hooked. And as they raced through the grueling, long and tiring Wonderland homestretch, the venerable old warrior from the west, brittle and battle-scarred though he was, would not be broken. He dauntlessly gave Rediscovery all he could handle, and then some….and 50 yards from the wire, began to draw away, going on to win the race by a widening length. He had a tired twinkle in his eye when they brought him off. He knew what he had done. I wrapped him in his warm blanket and gave him a head scratch and an ‘attaboy, Chee’, as his tail wagged a cursory acknowledgment. The publicity guy at the track came up to me and began asking me all about Master Chee, offering his appraisal that Chee ran a ‘hell of a race’, or something like that. The official took the urine sample, and Chee ambled off stiffly as usual, to get his post race drink and to have his feet washed. As soon as he realized who it was, we both shared a good laugh. Chee was, after all, nearly 5 years old, ancient for a racing greyhound. When we got back to the kennel, I took Chee out to the turnout pens, to make sure he was all right. He came over and nuzzled my leg, and looked at me with those guileless, honest, liquid—almost effeminate—dark brown eyes of his, as if to say….”I’ve still got some chops”. We went inside, and I rubbed him with strong liniment and put him to bed. And then I bent down and held his head in my hands, just looking, for a moment, at that noble, old grey muzzle, and truly trying to appreciate the wonder of what I had just beheld, and how lucky I was to have known one of the better greyhound angels. Not too long afterwards, Chee was to return to Portland, and finish out his career there. I would never see him again. He had, as it turned out, saved his best performances for last, though. You see, in another feature race, soon after defeating the brilliant Rediscovery, the venerable Master Chee did the same thing to the great Hondo Monopoly. It was a virtual rerun of his previous, emphatic statement. Well, the time always comes. There is a time for all things, and sadly, there is a time for goodbyes. We said ours, and Chee went home to Oregon. I took some comfort in figuring that when there were little Master Chees, I might be fortunate enough to handle one that forged in his spirit and his image. One morning, a couple of weeks after Chee had departed, I was having my coffee, while some of the greyhounds were walking on the treadmill. I was only half-looking at the most recent copy of the Racing Record, which was a tabloid, weekly trade paper, featuring results, stories and race charts from every track across the country. ‘Pictured are…from left to right…the leadout…the patrol judge…and…the director of racing…who presents the winning trophy to the owner of the Portland Inaugural Champion…Master Chee’.